« After the Fall: How Do Young Closers Respond to Blown Saves in October? Labor peace in baseball has become a given, which is remarkable considering the contentious history between the players and owners. However, after reading a summary of the new CBA unveiled this afternoon, it appears as if the partnership between owners and players is even stronger than imagined. In the past, negotiations between the two sides were more like a battle of attrition in which changes were enacted only by give and take. This time around, both parties seemingly took a more pro-active approach, co-authoring some of the most sweeping changes in recent history. Although many of the final details have yet to be revealed, enough information is available to make an early assessment about the new CBA. A summary of the key changes is listed below, with an analysis provided after each section. Baseball's new CBA was the product of a partnership, not battle, between the owners and players. Each league will have two wild cards that will play each other for the right to proceed to the Division Series. The Houston Astros will move to the A.L. West in 2013, at which point interleague will be played on a revolving basis throughout the season. The active roster will increase to 26 for certain doubleheaders. The expansion of the wild card has been rumored for months, so it shouldn’t come as surprise. Although some will lament the dilution of the playoffs, in reality, the addition of a wild card is a de facto extension of the regular season. By placing wild cards at a significant disadvantage, the integrity of the division (and, by extension, the 162-game schedule) has been restored. As a result, baseball has made its postseason more select than it had been under the four team format. The extension of interleague play will likely be derided by many, but the fact remains these games have repeatedly drawn higher ratings and attendance figures. Assuming schedule balance is maintained within divisions, playing a greater variety of teams should be a positive, especially if it comes at the expense of the uneven slate of games that has been played between the divisions within each league. Managers will probably be very happy about having an additional player for double headers, but the potential competitive advantage seems negligible. The Type-A and Type-B classification will be eliminated. The player must have been with the team for the entire season. The team must offer the player a one-year contract with a salary equal to the average salary of the 125-highest paid players from the prior season (currently about $12 million). Only the first 10 picks are protected. Teams losing an eligible player will not only receive forfeited picks from signing clubs, but also supplemental picks between the first and second rounds. The percentage of “Super Two” players will increase from 17% to 22% of those with two years of service time. 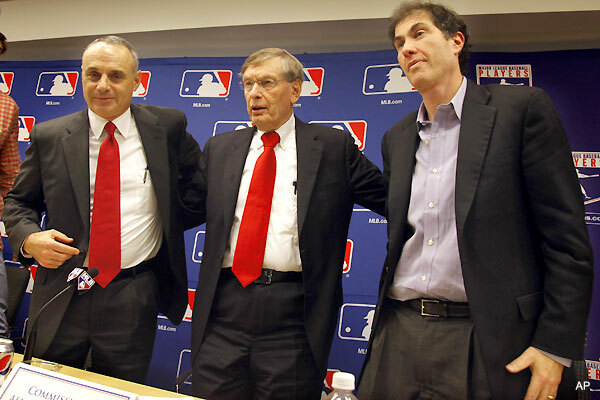 Major and Minor League minimum salaries will increase to $500,000 and $81,500 by 2014, with COLA adjustments thereafter. Eliminating the confusing and counter-intuitive Elias ranking system is a big plus for teams and players alike. In addition, all teams should benefit from removing the uncertain link between arbitration and compensation. Now, clubs can either choose to make a minimum contract offer or forfeit the compensation, whereas in the past, they had to weigh the risks of offering arbitration. One possible draw back for small market teams, however, is the new rule that prohibits free agent compensation for players acquired mid-season. As a result, the trade value of pending free agents will be lessened, placing sellers at more of a disadvantage. All draftees will be required to sign minor league contracts. Each club will be allotted a pool of available funds for signing players. The pool will be based on the assigned value of each pick that the team has in the first 10 rounds. Players selected after the first 10 rounds will be allotted a bonus of up to $100,000. Payments in excess of that amount will count against the pool available for the first 10 rounds. 0-5% overpayment will lead to 75% tax on the overage. 10-15% overpayment will lead to 100% tax and loss of first and second round pick. 15%+ overpayment will lead to 100% tax and loss of first round pick in next two drafts. Proceeds generated by the penalty tax will be paid to clubs who are revenue sharing payees, provided they are not among the teams who exceeded their allotment. Forfeited picks will be redistributed via a lottery in which the chance of winning will be inversely related to a teams’ prior year winning percentage and revenue. Only teams that do not exceed their bonus pool allotment will be eligible. A Competitive Balance Lottery will award six addition draft picks to teams selected from among those that rank in the bottom-10 in revenues or market size. The odds of winning will be based on the prior season’s winning percentage. The picks will take place between the first and second rounds. A second lottery of six picks, which will take place between the second and third rounds, will involve teams who do not win a selection in the first lottery and all other revenue sharing payees. The top-200 prospects will be subject to a drug testing program. Along with the changes to the International Free Agency procedures, these adjustments could have the biggest impact. The most dramatic change involves the tax system, which seems more designed to control industry-wide costs than foster competitive balance. Because the pools will be based on specific values assigned to individual draft selections in the first 10 rounds, it’s difficult to assess both the fairness to amateur players and potential impact on teams. If, like the Competitive Balance Tax (CBT), the threshold is set so high that only the very wealthy would exceed it anyway, the new system could have very little effect. However, if the slot recommendations are more modest, the taxes would become more onerous, and, ironically, could actually serve to increase the advantage enjoyed by large market teams (who can both afford to pay the tax and make up for lost draft picks by dabbling in free agency). The devil is in the details, but if framed properly, the new bonus pool system could turn out to be a fair compromise. In a perfect world, the Rule IV draft would be abolished, but in the real world, the lesser of evils can sometimes be an acceptable alternative. Another innovation is the Competitive Balance Lottery (CBL), which will give smaller market/low revenue teams the chance to earn addition draft picks. This system should be a help to small market teams, provided they can afford to pay the additional bonus. Perhaps with that in mind, the new CBA also talks about the assignment of picks awarded in the CBL, which could be a segue into a system that more broadly permits the trading of draft picks. A committee will be convened to discuss the possibility of an international amateur draft. For the 2012-2013 signing season, all teams will have an equal bonus pool from which to sign international amateur players. Thereafter, the size of each team’s bonus pool will be inversely related to their winning percentage in the prior season. A portion of each club’s bonus pool allotment will be transferable, subject to restrictions. 5-10% overpayment will lead to 75% tax and only one bonus over $500,000 will be permitted in the next signing period. 10-15% overpayment will lead to 100% tax and only one bonus over $500,000 will be permitted in the next signing period. 15%+ overpayment will lead to 100% tax and only one bonus over $250,000 will be permitted in the next signing period. All amateur players will be required to register with the Scouting Bureau, and the top-100 will be required to submit to drug testing. Because of the restrictions added to the Rule IV draft, similar changes had to be enacted on the international free agency side. Otherwise, large market teams could simply pocket their cost savings in the Rule IV draft and splurge overseas. In that sense, the CBA evens the playing field by putting international amateurs on par with their North American counterparts. Of course, the fairness of that is debatable, especially considering the relative lack of leverage enjoyed by international amateurs. Once again, the size of allotted bonus pools will go along away toward determining how equitable the system is to international players. Although the CBA calls for further discussion about an international draft, the implementation of a bonus pool system that is inversely related to winning percentage has, in effect, created something similar. Of course, for those very special players, large market teams will be more than willing, and able, to exceed the tax thresholds (the tax will simply become part of the player cost), so the system doesn’t achieve the same competitive balance impact as a draft. However, by allowing teams to trade a portion of their bonus pool allotment, the new system will give teams that normally wouldn’t spend big in the international market a chance to convert their allotment into another asset (kind of like cap and trade systems used in environmental regulations). One of the biggest concerns with making adjustments to the international free agency system is it could potentially discouraging teams from making investments in local academies. If that turns out to be the case, the result could be a decline in the quality and depth of the international talent pool, which would serve no one’s benefit. It remains to be seen how these changes will impact baseball’s investment in international markets, but, if in five years a decline becomes apparent, MLB should be prepared to reverse course. One final note is the CBA summary repeatedly references international amateur free agents, which presumably would exclude players from Japan and other recognized professional leagues. If so, this could be a potential loophole for international players seeking to circumvent the MLB bonus restrictions. Teams in the top-15 markets will be disqualified from receiving revenue sharing by 2016. Funds that would have been given to disqualified teams will be refunded to payors. However, those payors that have exceeded the luxury tax two or more consecutive times will forfeit some or all of their refund. In 2014, the threshold will increase from the current $179 million to $189 million for the remainder of the CBA. If a team moves below the CBT threshold, it will be treated as going over for the first time should it exceed the limit again. Preventing large market teams who fail to generate revenues from collecting payouts is a common sense change. However, the more impactful element of this policy could be the refund forfeiture faced by teams that exceed the CBT threshold. In a sense, this policy creates a second luxury tax, which could further discourage teams from crossing line. Having said that, the number of teams that even approach limit should be few, and those that have done so regularly aren’t likely to be discouraged by this change. The EBITDA multiplier has been lowered to 8x (from 10x), and to 12x (from 15x) for teams with stadium-related debt within the first 10 years of its issuance. Any debt serviced by a team’s funds or assets will be eligible for the Debt Service Rule. These changes are specifically designed to address the problems created by the ownership turmoil in places like Los Angeles and New York. By not only reigning in debt, but restricting the extent to which team funds can finance other operations, this augmented rule may be able to help prevent future bailouts and bankruptcies, which are bad for business across the board. Use of smokeless tobacco is prohibited during televised interviews and appearances. Also, prohibitions on the use and possession of smokeless tobacco will be implemented. Players who are suspected of an alcohol problem will submit to a mandatory evaluation. Low density maple bats have been outlawed. In 2013, new, safer helmets will become mandatory. The existing concussion policy will be further developed. Any measure that seeks to prolong the health of players should be a no-brainer, and all of the provisions mentioned above are long over due. Now, if only baseball would be willing to address the absurd precedent that allows catchers to block the plate and base runners to pretend they are defensive backs. Beginning in Spring Training 2012, all players will be subject to HGH blood testing for reasonable cause at all times during the year. All players will be tested each Spring, and some will be subject to random, unannounced testing during the offseason. A study will be commissioned to explore expanding the policy to include in-season testing. Considering there is no evidence to suggest that HGH is a performance enhancing drug, this measure amounts to little more than window dressing. For that very reason, it makes every sense in the world. Now, baseball gets to thumb its nose at other sports like the NFL, while continuing to distance itself from the stigma created by the recent steroid era. Participation in the All-Star Game will be required, with limited exception. A social media policy will implemented. Instant Replay will be expanded to include fair/foul and “trapped” ball plays. An improved process for challenging official scoring decisions will be implemented. The proposed expansion of instant replay must first be agreed upon with the Umpire’s union, and there could be some difficult details to iron out, particularly how to go about reversing a foul call when there are runners on base. If the new system is used judiciously and implemented expeditiously, the expanded use of replay should be a benefit. However, baseball needs to be careful about how much replay it adopts because constant delays and overturned calls could detract from the continuous motion of the sport (and, perhaps, create an NFL-style penalty lag). The All Star Game provision is likely to draw derision, but it’s one I have long advocated. The MLB All Star Game remains a marquee event, and every effort should be made to ensure it remains that way. If baseball wants the game to continue to be a showcase, attendance requirements (or inducements) are necessary. How the CBA will enforce this change is not yet known, but hopefully the new rule is more than just lip service.